Conner Quick Painting and Decorating - Painter/Decorator based in Rainham, Kent. 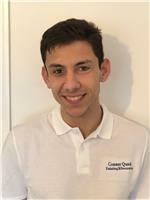 Conner Quick's Painting and Decorating service is a sole trader based business, based in the South East, which has been running for 2 years. I have City & Guilds NVQs at levels 1,2 and 3. I provide a service that is stress-free and is personal to yourself, providing interior and exterior work. Offering a FREE quotation as well as professional advice to transform your ideas into a reality.